Welcome to Flathead Lake Monster Charters! Welcome to Flathead Lake Monster Charters’ 2019 fishing season! Our 23’ Grady-White has upgraded electronics, new left-handed reels, and the gear to catch trophy trout. Last season we landed over 50 slot fish (30 – 36 inches), 30+ over 36 inches, and a few over 40 inches. Our catch and release survival rate was 98%. Looking forward to another great season of fishing with new and seasoned anglers! Please call soon to book your Monster Charter experience. 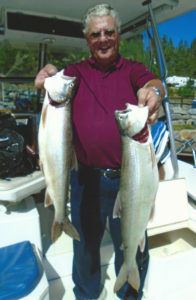 Captain Hank has been fishing Flathead Lake for 15 years, the last 5 as a Monster Charter Guide. Enjoy a hands-on experience, learn techniques and catch BIG fish! Join us on a one of a kind fishing adventure, where you are guaranteed to catch a fish! Or your next trip is on us. 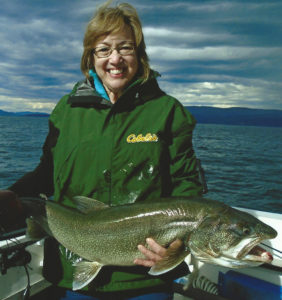 Flathead Lake Monster Charters practices catch and release of trophy fish. Customers receive a free tshirt for releasing any fish over 36 inches! Chances of catching trophy fish are higher during morning charters. If you’re after a trophy mack, the morning charters are your best bet! 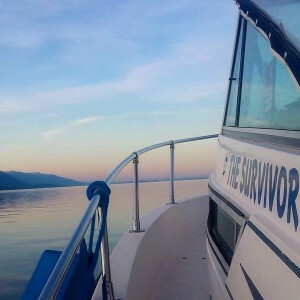 We offer both Full and Half Day Charters on the beautiful Flathead Lake of Montana. Kids age 12 and under are free of charge. We provide snacks, soda and water for each charter. Lunch is also included on full day charters. All tackle is provided, and fish cleaning included. We operate on a 23 foot Grady-White Gulfstream boat, with an enclosed cabin/porta potty. 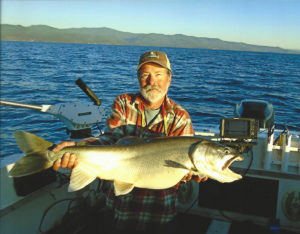 Flathead Lake Monster Charters operates out of Hidden Harbor in Woods Bay. Enjoy a brew or a bite to eat at the nearby Saddlehorn Bar & Grill, open for lunch or dinner. Call to book your next Flathead Lake Monster Charter!